In anticipation of the upcoming presidential election in the United States, I have asked many people why they support their candidate of choice. I was curious how my own decision making process aligned, or not, with other people’s. Reasons varied, of course, but generally focused around job qualifications and policy stances. Very few people, thought, cited principles, their own or the candidates, when telling be about their decision making process on who to vote for. 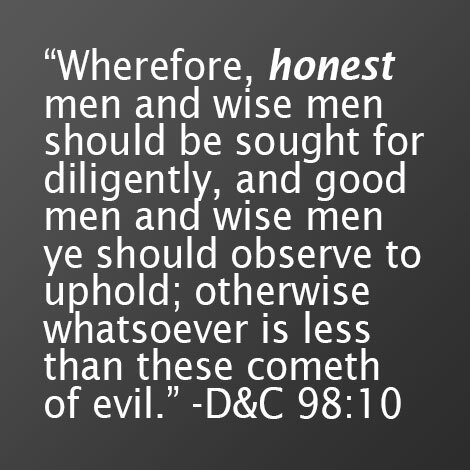 The primary and overriding character trait I am looking for from a political official is honesty and integrity. I don’t care how smart, how politically savvy, how well spoken, and how talented an individual is, if I cannot trust that they’ll always act with integrity, then I don’t want them in a leadership position. I would gladly vote for a less qualified, less capable candidate who is honest over a more qualified and capable candidate that I cannot trust. “Discipleship includes good citizenship. In this connection, if you are a careful student of the statements of the modern prophets, you will have noticed that with rare exceptions—especially when the First Presidency has spoken out—the concerns expressed have been over moral issues, not issues between political parties. 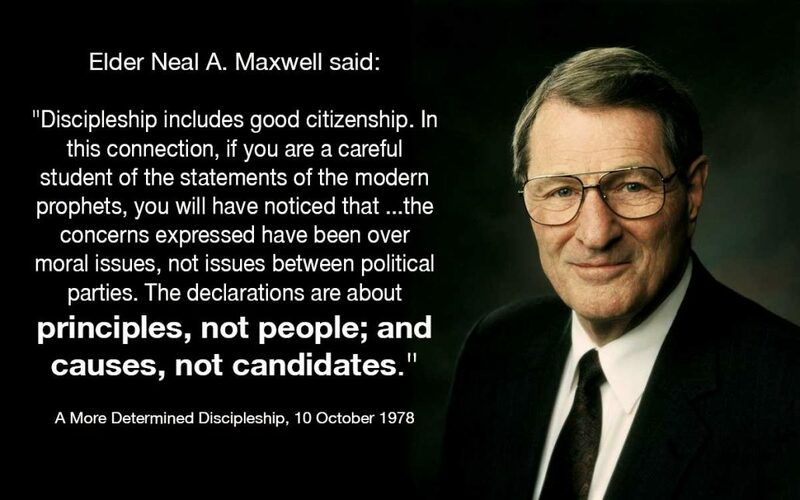 The declarations are about principles, not people; and causes, not candidates” (A More Determined Discipleship, 10 October 1978). Here’s what I found from the Church on how to vote, or as I’m calling it, gospel principles for choosing political candidates. “And that law of the land which is constitutional, supporting that principle of freedom in maintaining rights and privileges, belongs to all mankind, and is justifiable before me. Therefore, I, the Lord, justify you, and your brethren of my church, in befriending that law which is the constitutional law of the land; And as pertaining to law of man, whatsoever is more or less than this, cometh of evil. I, the Lord God, make you free, therefore ye are free indeed; and the law also maketh you free. Nevertheless, when the wicked rule the people mourn. 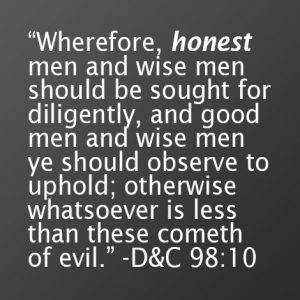 Wherefore, honest men and wise men should be sought for diligently, and good men and wise men ye should observe to uphold; otherwise whatsoever is less than these cometh of evil” (D&C 98:5-10). “I myself was blessed with an exemplary father. I recall that when I was a boy of about 12, my father became a candidate for the city council in our rather small community. 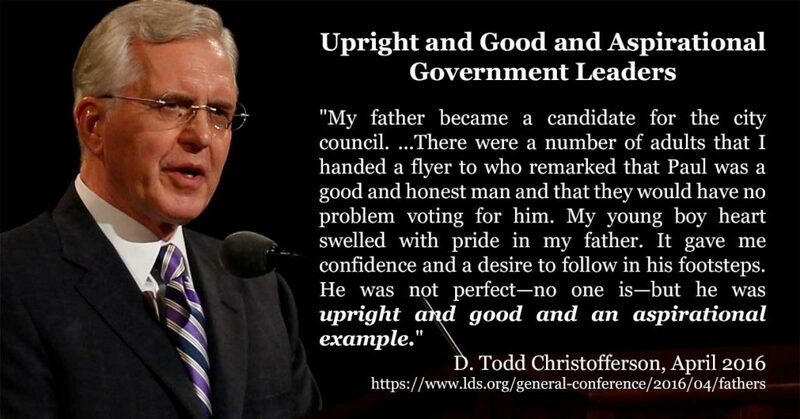 He did not mount an extensive election campaign—all I remember was that Dad had my brothers and me distribute copies of a flyer door to door, urging people to vote for Paul Christofferson. There were a number of adults that I handed a flyer to who remarked that Paul was a good and honest man and that they would have no problem voting for him. My young boy heart swelled with pride in my father. It gave me confidence and a desire to follow in his footsteps. He was not perfect—no one is—but he was upright and good and an aspirational example for a son” (from his talk entitled Fathers). John Taylor, the third President of the Church of Jesus Christ of Latter-day Saints, said this in 1855: “We believe that all legislative assemblies should confine themselves to constitutional principles; and that all such laws should be implicitly obeyed by every American . . . .We believe that legislators ought to be chosen on account of their intelligence, honor, integrity, and virtue, and not because they belong to some particular party clique. We believe that the high party strife, logrolling, wirepulling, and political juggling, and spoliation, are a disgrace to any politician, that they are beneath the dignity of an American, and disgraceful and humiliating, alike to the people and statesmen of this great republic” (John Taylor, 1855, Gospel Kingdom, p. 310). This quote was found on TheMoralLiberal.com, among other online sources. Finally, here is another quote I really like from Ezra Taft Benson. I put it last because I’m not certain of the accuracy of the source. I only found it one a single website called inspiredconstitution.org. According to the site, this is a statement from Ezra Taft Benson as quoted by Jerreld L. Newquist in his book, Prophets, Principles and National Survival. “There are some people who hesitate to get into this fight for freedom because it’s controversial, or they’re not sure if we’re going to win. These people have two blind spots. First, they fail to realize that life’s decisions should be based on principles—not on Gallup polls. There were men at Valley Forge who weren’t sure how the Revolution would end, but they were in a much better position to save their own souls and their country than those timid men whose major concern was deciding which side was going to win, or how to avoid controversy. After all, the basic purpose of life is to prove ourselves—not to be with the majority when it’s wrong. We must discharge responsibilities not only to our church, home and profession, but also to our country. Otherwise, we do not merit the full blessings of a kind Providence. There are people tonight all over the world who in their own courageous and sometimes quiet way are working for freedom. In many cases we will never know until the next life all they sacrificed for liberty. These patriots are receiving heaven’s applause for the role they are playing, and in the long run that applause will be louder and longer than any they could receive in this world. I want to help save the country by casting my vote for someone who will strengthen our nation. But as President Benson said, I am most concerned about the salvation of my soul and that can only be done by staying on the Lord’s side and following his counsel as received through His Spirit, the scriptures, and the modern prophets. That counsel tells me that I should not select candidates for political office based on party affiliation or the way the polls tell me other people are voting. Therefore, I will cast my vote based on principles, mine and the candidates. I will seek out and vote for the candidate who, in my evaluation, has demonstrated wisdom and competence, who loves freedom and goodness, and who, most importantly, has honesty and integrity.